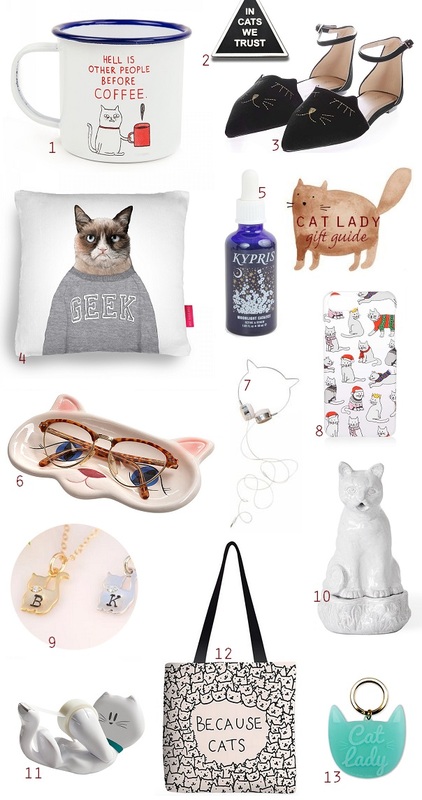 exPress-o: Christmas Gift Guide #5: Cat Lady. 1. 'Hell is other people before coffee' mug - 2. Cat enamel pin - 3. Cat pointy shoes - 4. Grumpy cat cushion - 5. Moonlight catalyst - 6. Cat glasses tray - 7. Cat headphones - 8. Christmas cat iPhone case - 9. Olive Bella personalized cat necklace - 10. Setsuko cat incense burner - 11. Scotch kitty dispenser - 12. Because cats tote bag - 13. Cat lady key-chain. P.S: Fancy more? Here is one from last year and from two years ago. P.P.S: Plus, all the gift guides so far this year. I want everything on this list, but the mug (I love Gemma Correll! ), the tray, the headphones and incense burner are my favourites.